Civil forfeiture threatens the property rights of all Americans. These laws allow the police to seize your home, car, cash or other property upon the mere suspicion that it has been used or involved in criminal activity. Georgia has some of the worst civil forfeiture laws in the country. But, in an attempt to at least ensure civil forfeiture is subject to public scrutiny, state law requires local law enforcement agencies to annually itemize and report all property obtained through forfeiture, and what they did with it, to their local governing authorities. Amazingly, many, perhaps most, local law enforcement agencies simply fail to issue these forfeiture reports. For these agencies, their forfeiture proceeds are “off budget” slush funds shielded from public view. Until the Institute for Justice filed a lawsuit the Atlanta Police Department, Fulton County Police Department, and Fulton County Sheriff all regularly failed to produce mandated forfeiture reports. This dereliction of duty concerns Georgia citizens, including Ryan Van Meter, Anna Cuthrell, Joseph Kidd, Josiah Neff and Tsvetelin Tsonevski, all taxpaying residents of Atlanta and Fulton County. They filed this lawsuit to force the head officers of these three local law enforcement agencies to disclose all of the property they have seized under applicable Georgian forfeiture statues along with how they have utilized that property, preventing that property from becoming a slush fund. The issue of the case was not complicated: Law enforcement should follow the law. Faced with no way out, all three agencies agreed to comply with state law, both for past reports and going forward, and submitted to court orders forcing them to do so. With this victory, the Institute for Justice was able to shed some light on the dark world of civil forfeiture. Law enforcement should follow the law. In Georgia, however, local law enforcement agencies routinely ignore a simple reporting law that requires them to itemize all money and other property they acquire through civil forfeiture, and report what they do with those assets. This evasion of state law enables law enforcement to create what can only be described as hidden slush funds, as up to 100% of civil forfeiture assets can be used for law enforcement purposes. Georgia’s civil forfeiture law themselves are bad, but evading their reporting requirements make the state’s problem even worse. Under civil forfeiture, the government may confiscate both personal and real property such as homes, cars, and even cash that are allegedly connected to the commission of a crime. Civil forfeiture differs greatly from its criminal counterpart. With criminal forfeiture, it is the owner who is on trial, and the property can only be forfeited if the owner has first been convicted of a crime. But with civil forfeiture, the government can proceed against the property directly under the legal fiction that the property somehow acted to assist in the commission of a crime. But perhaps the most troubling aspect of modern civil forfeiture laws is the profit incentive at their core. The overriding goal for law enforcement officials—both prosecutors and police—should be fair and impartial administration of justice. 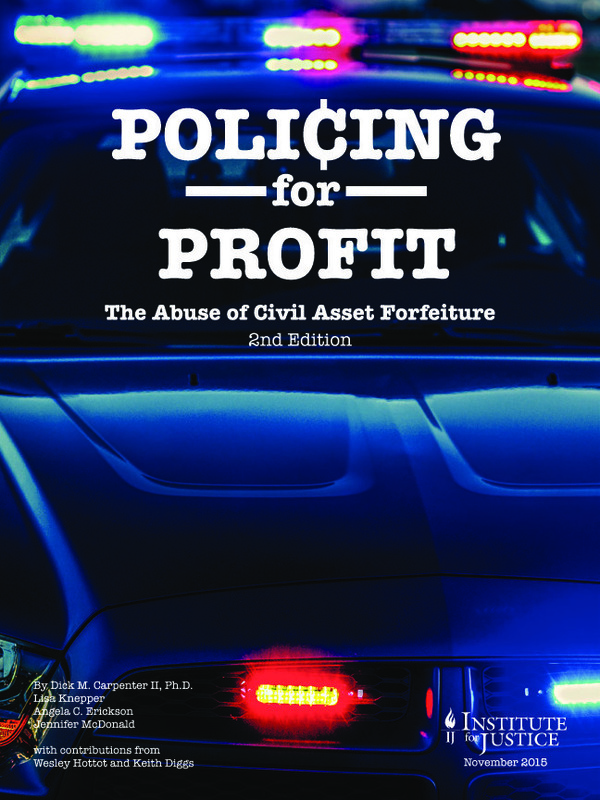 Civil forfeiture law at the federal level and in over 40 states, though, dangerously transforms law enforcement priorities away from this goal and instead toward the pursuit of property and profit. Georgia is one of those states that permit police and prosecutors to keep up to 100% of forfeiture proceeds for their own use. Across the country, civil forfeiture proceeds are notoriously opaque. Only 29 states require reporting of property seized via forfeiture and even in those states, such as in Georgia, reporting laws are not properly enforced.2 Georgia law is clear that local law enforcement agencies must publicly account for the property and assets they obtain through civil forfeiture. Yet many agencies simply chose to ignore the law. This is a breach of the public trust and a betrayal of taxpayers. The Institute for Justice has filed a lawsuit, Van Meter v. Turner, where a group of Georgia citizens are seeking to make their own local law enforcement agencies—the Atlanta Police Department, Fulton County Police Department, and Fulton County Sheriff—follow Georgia’s forfeiture reporting law. This case, the latest by the Institute to stop forfeiture abuse on a national level, presents an opportunity to shine the light upon Georgia’s civil forfeiture practices through simply enforcing the law. Unlike a criminal proceeding in which legal action is brought against an individual, in civil forfeiture, the government proceeds against the property directly, as if the property somehow acted to assist in the commission of a crime. It is a scheme based on 17th-century maritime law that permitted courts to obtain jurisdiction over property when it was virtually impossible to obtain jurisdiction over the property owners— pirates, for example—guilty of violating the law. One key feature of Georgia’s civil forfeiture law is how it shifts the burden of proof in forfeiture cases. In a criminal case, the government must prove its case against the accused, who is presumed innocent. If it cannot, the accused goes free. The burden of proof is on the government. In Georgia, the burden to prove that seized assets were not related to criminal acts rests on the person whose assets were seized. In other words, the property owner is presumed guilty and has to prove his innocence to get his property back.4 And the government only needs to meet a low “preponderance of the evidence” standard to hold on to seized assets.5 This standard is significantly lower than the “beyond a reasonable doubt” standard law enforcement must meet to convict a person of a crime, again putting owners at a disadvantage. Another reason for the D- grade is that up to 100% of forfeiture money can go to law enforcement under Georgia law.6 This provides Georgia police with a strong incentive to go after property instead of criminals. It also provides law enforcement with large amounts of cash and other assets that they do not have to get through the normal budgetary channels, i.e., convincing elected representatives to levy taxes or issue bonds. This money and property becomes a “self-funding” mechanism exempt from the democratic process. This specific statute concerns forfeitures related to drug crimes (which in itself constitutes most civil forfeiture), but statutes of many other criminal offences incorporate the statute by reference.8 Thus, local law enforcement agencies are legally required to report almost all forfeitures proceeds. Despite this crystal clear command, many, perhaps most, Georgia law enforcement agencies simply fail to report their forfeitures.9 Thus, millions upon millions of dollars flows every year through law enforcement coffers without notice to outside elected officials or taxpayers. The temptation for abuse with that money is obvious. The money and property obtained through forfeiture can easily turn into a slush fund. Not only that, the failure to report is in violation of state law. It is not as though the legislature required these reports but then forgot about them. Just last year it passed a new law that requires all local units of government to make their financial records publicly available on a website run by the University of Georgia’s Carl Vinson School of Government. In addition to general budgets, the law singles out forfeiture reports, the exact same ones that law enforcement agencies chronically fail to make. Thus, not only does state law require law enforcement to account for their forfeiture money and property, but they make that accounting publicly available on the Internet. To put it bluntly, Georgia law enforcement is violating the law. To gain some sense of the extent of forfeiture actions under Georgia law, as well as to find out whether reporting requirements are being followed, we randomly selected 20 Georgia law enforcement agencies10 and requested from each agency’s financing municipality a copy of the annual forfeiture report required by law. Only eight of the 20 surveyed municipalities responded with the relevant information.11 These reports show the receipt and expenditure of amounts between a few thousand dollars and well over half a million dollars in a single year. However, of the eight localities that sent information only two are in full compliance with the law. The remaining six have several issues which keep them in non-compliance. First, the requests in all six of these localities were passed off to law enforcement agencies, suggesting the municipalities are not in possession of forfeiture information as the law requires. Secondly, two of the six responses did not appear to be formal reports but simply information compiled to fulfill our open records request. Finally, another two of the six municipalities did not report expenditures as required. Thus, based on this random sample, compliance with the law appears spotty at best with only two of the 20 law enforcement agencies reporting as required. But since the random selection of agencies skewed toward smaller counties and cities, it is possible some of these smaller agencies do not participate as frequently in state-level forfeiture and therefore simply have nothing to report. To test this theory, we requested annual reports for the police departments in the five most populous counties and cities in Georgia.12 We requested these documents from both the financing municipalities and law enforcement agencies themselves to maximize the chances we would find the data we were after. In total we made 20 requests in hopes of obtaining 10 documents. We received one of the 10 reports we sought. None of the counties sent a forfeiture report. Clayton, Fulton and Gwinnett Counties admitted no report existed in their records. Cobb and DeKalb counties sent some relevant forfeiture data, but had not completed the formal report required by law. We then followed up by requesting copies of required reports from sheriffs’ offices in the five counties listed above. These offices were equally poor in complying with the law with none of the five supplying us with reports. The Clayton and DeKalb county sheriffs did not respond and the Cobb, Fulton and Gwinnett sheriffs sent some information but not the formal report required by law. From this evidence it is clear that what routinely happens in Georgia is local law enforcement fails to provide forfeiture reports with their budget request, and their city and county governments fail to ask for them. Law enforcement is thumbing its nose at its citizens, keeping them in the dark on what they are doing with forfeiture money. Ryan Van Meter is a native Georgia citizen, Atlanta resident and taxpayer, and graduate of the University of Georgia. Anna Cuthrell is also an Atlanta resident and taxpayer. Both cannot believe that their local law enforcement has been allowed to keep forfeited property and not report it to anybody. These taxpaying residents of Atlanta and Fulton County simply want to have their own law enforcement agencies report their forfeiture practices. Thankfully, these concerned citizens can do something about the law breaking of their own law enforcement. Georgia provides citizens with a cause of action against government officials who refuse to follow mandatory public duties.15 Armed with this, they and three other residents of Atlanta and Fulton County, Joseph Kidd, Josiah Neff, and Tsvetelin Tsonevski, have joined with the Institute for Justice. They are asking the Superior Court of Fulton County to order the chief officers of the Atlanta Police Department, the Fulton County Police Department, and Fulton County Sheriff to file forfeiture reports. The lawsuit is not the only attempt IJ is making to fight civil forfeiture abuse in Georgia. To help states improve their law, IJ commissioned a team of experts to draft a model asset forfeiture law that every state legislature could adopt completely or in parts. Building on the laws in the handful of states with good forfeiture laws, IJ released comprehensive model legislation that premised on two simple but important ideas: (1) law enforcement agencies should not profit from forfeiture and (2) a jury should find the accused guilty of a crime before the state takes final title to his or her property. This model legislation is an important component of IJ’s strategy to ensure that every American’s property is safe from the abuse of self-enriching enforcement of asset forfeiture laws. The model is the basis for legislation that will shortly be introduced in Georgia by Representative Wendell Willard (R – Sandy Springs), chairman of the Judiciary Committee in the Georgia State House of Representatives. The lead attorney in this case is Institute for Justice Senior Attorney Scott Bullock, who has litigated a number of property rights challenges, especially in the realm of forfeiture and eminent domain abuse. He is joined in the litigation by Anthony Sanders, staff attorney the Institute for Justice Minnesota Chapter. Yasha Heidari of the Heidari Power Group is local counsel for the case. The case is the latest in IJ’s ongoing forfeiture initiative. The initiative brings together various efforts, including litigation, strategic research projects, and legislation efforts. For example, IJ is currently challenging Texas’ civil forfeiture laws in litigation in that state. 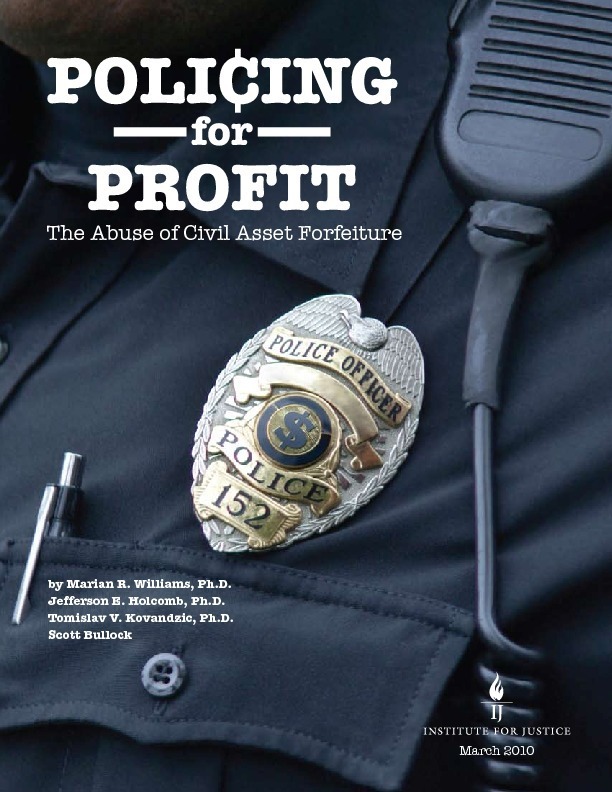 At the same time that case was launched in March 2010, IJ unveiled the report Policing for Profit: The Abuse of Civil Asset Forfeiture, which detailed civil forfeiture abuse and rated civil forfeiture systems in all 50 states. Further, IJ is pursuing reform in state legislatures, having authored model legislation that states can adopt in ending civil forfeiture altogether. State of Texas v. One 2004 Chevrolet Silverado—The State of Texas took the truck of an innocent owner and refused to give it back. To right this outrage, and attack various unconstitutional aspects of Texas’ civil forfeiture laws, the Institute for Justice is representing small businessman Zaher El-Ali, a man the state admits had nothing to do with the alleged criminal activity that led to his truck’s seizure. Utahans for Property Protection—IJ represented a group of Utah citizens that filed a “notice of claim” with the attorney general of Utah, successfully forcing him to take immediate action to secure the return of the funds for forfeitures that should have gone to public education. Wells v. City of Riviera Beach—In May 2007, the Institute for Justice successfully defeated an attempt in Riviera Beach, Fla., to displace more than 5,000 residents for a massive private development project that included a yacht marina, luxury condominiums and upscale hotels. City of Norwood v. Horney—In a resounding repudiation of the U.S. Supreme Court’s decision in Kelo v. City of New London, the Ohio Supreme Court unanimously ruled in July 2006 that the city of Norwood acted unconstitutionally by taking the homes of the Institute for Justice’s clients. Kelo v. City of New London—Just three years after the landmark U.S. Supreme Court ruling in Kelo v. City of New London that allowed private property to be taken for economic development, 43 states have tightened their restrictions on eminent domain. In 2007, IJ client Susette Kelo’s little pink cottage—the home that became a national symbol of the fight against eminent domain abuse—was moved rather than allowing it to be demolished by the government’s wrecking ball. The Institute for Justice is a public interest law firm that advances a rule of law under which individuals can control their destinies as free and responsible members of society. Through litigation, communication, outreach and strategic research, IJ secures protection for individual liberty and extends the benefits of freedom to those whose full enjoyment is denied by the government. The Institute for Justice is based in Arlington, Virginia. IJ has state chapters in Arizona, Washington, Minnesota and Texas, as well as a Clinic on Entrepreneurship at the University of Chicago Law School.